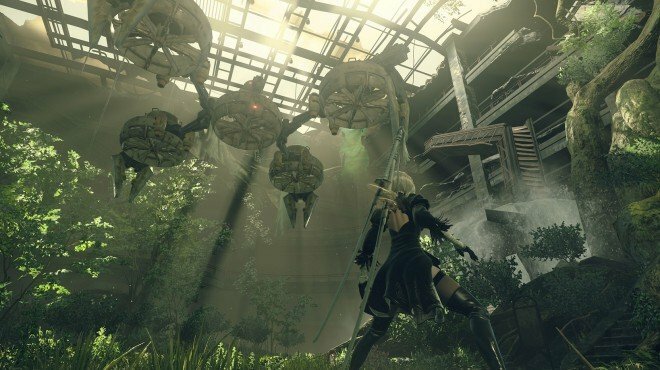 Missile Supply Mission is a Main Story Quest in NieR: Automata. "Support the missile supply mission." Speak with Anemone during Resupply to obtain this quest. To access the Flooded City, you must head to the City Ruins and investigate a large broken pipe located above the Cave area that appears after the Assault event. Nagivate the pipes until you come out on the coastal side of the city. It is very easy to fall to your death, so be mindful of edges and jumps, and attack enemies with ranged attacks wherever possible. You will have to make large jumps to avoid the water. Remember Jump > Evade / Dash > Jump covers the most ground. You will face a larger group of enemies including a Reverse-jointed Goliath. When they are defeated, Command will give you more instructions. Near this platform, behind a building, you can find a locked door and an Apologetic Machine. Board the flying units and fight through a shooting section until you arrive at the ship. A large enemy unit will challenge you, it is not too difficult if you remember to use R2 to dash away from its powerful beam. After this, an even larger unit will emerge from the sea bed and destroy the ship - you must now fight it. Scroll your way through many enemy waves, dodging deadly lasers, until you reach the EMP at the back. Destroy the five weakpoints of the EMP and Command will execute a laser attack from above. It is insufficient, but reinforcements lead by 4B arrive and allow you to disengage and head back to shore. 9S proposes that you use close rage mortars to attack. Mount the Rail Cannon Unit and fire into the machine's mouth to weaken it. The machine will emit a powerful EMP that almost wipes you out, but Pascal will show up just in time to rescue you and fill you in the details: the enormous machine was constructed centuries ago to detroy Androids, but went berserk and machines have lost control over it. You must continue to fight it while 9S pursues a plan. Survive and defeat all the weak spots and a cutscene will trigger unlocking the trophy Ruler of the Deep. You will recover awareness and contact command, Operator 60 informs you it has been 8 hours and data uploading is down, and 9S is missing. This begins the main quest: 9S MIA. Completing this quest will make most sidequests in the game unavailable until the next playthrough. and I refuse, to continue, without getting in there, even if I can revisit it, after completing the entire game & unlocking chapter select. as the main quest & the last lunar tear, are right next to each other. WARNING: DON&apos;T complete this mission before finishing all the side quests. Completing this quest will make most side missions unavavilable.